When you enter our office, Conie or Marlene will welcome you as a member of our family. We will ask that you complete our new patient forms located in the New Patient Centre. This important background information gives Dr. Kris Dorken your health history and information on your condition. Next, you will have a consultation with Dr. Kris Dorken to discuss your health-related problems, concerns, and potential treatment options. This initial visit is designed for Dr. Kris Dorken to learn more about you, your condition, and expectations to determine how chiropractic care can meet your goals. After your consultation, Dr. Kris Dorken will perform a complete chiropractic examination testing your range of motion and flexibility. Other standard neurological, orthopedic, postural, and physical tests will be performed as well. Nothing will be done in our office without your consent. As per your results of the examination, we may take Digital X-rays as well. Our digital x-rays are done in the office. These will help to show if there are any underlying spinal conditions and to develop an effective personalized treatment plan. The Digital X-rays are an opportunity for you to see if there are any misalignments for yourself. This step is important in making a final diagnosis and program plan. Once your information is collected and your examinations are finished, Dr. Kris Dorken will give you a detailed report of all findings and answer any questions you have including: 1. How can you help me? 2. How often do I need to come in? 3. What will my treatment cost? 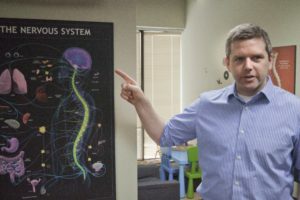 After reviewing your health history, goals, and examining your spine and Digital X-rays, Dr. Kris Dorken will provide the best treatment and wellness program for your specific needs. Your first visit may also include your first chiropractic adjustment. An ongoing wellness program including chiropractic adjustments and at home exercises may be prescribed. We can also help to create a healthy eating and lifestyle plan that is made just for you. Call us on 416 479 8311 to discuss how we can help relieve your pain and achieve optimal wellness for you to be at your best.